Version 6! Color, Colors, Everywhere! This hat uses all sc. I crochet tightly so I went up 2 hook sizes to get the hat to fit properly, otherwise it would have been very small and very tight! Keep that in mind when creating this hat. Colors are listed at bottom of page. You can use your own combinations of colors. It takes a few yards for each row. I used leftovers from an afghan I made. Don’t forget to crochet over ends in each row! You will be glad you did! Ch 4, sl st in first ch made, change to color B. Round 7. Repeat Round 6 changing to color A in last sc. Round 8. Repeat round 6 changing to color B in last sc. Round 9. Repeat round 6 changing to color C in last sc. Round 10. Repeat round 6 changing to color D in last sc. Round 11. Repeat round 6 changing to color E in last sc. Round 12. Repeat round 6 changing to color F in last sc. Round 13. Repeat round 6 changing to color G in last sc. Round 14. Repeat round 6 changing to color H in last sc. Round 15. Repeat round 6 changing to color A in last sc. Round 16. Repeat round 6 changing to color B in last sc. Round 17. Repeat round 6 changing to color C in last sc. Round 18. Repeat round 6 changing to color D in last sc. Round 19. Repeat round 6 changing to color E in last sc. Round 20. Repeat round 6 changing to color F in last sc. Round 21. Repeat round 6 changing to color G in last sc. Round 22. Repeat round 6 changing to color H in last sc. Round 23. Repeat round 6 changing to color A in last sc. Round 24. Repeat round 6 changing to color B in last sc. Round 25. Repeat round 6 changing to color C in last sc. Round 26. Repeat round 6 changing to color D in last sc. Round 27. Repeat round 6 changing to color E in last sc. Round 28. Repeat round 6 changing to color F in last sc. Round 29. Repeat round 6 changing to color G in last sc. Round 30. Repeat round 6 changing to color H in last sc. Remember to check to see if you need to add or decrease rounds for proper length of your hat. This hat was made with Bernat, Berella “4”, acrylic yarn, a size K hook, 30 rounds and no edging. The color names for Bernat, Berella yarn are, True Periwinkle Blue, True Taupe, Burgundy, Dark Taupe, Rich Periwinkle Blue, Soft Forest Green, Deep Forest Green, and Soft Periwinkle Blue. Version 6! A color explosion! This week's hat uses more colors than last week's! While working on this hat I got my threads all tangled up twice! since he has been doing it for about ten years! I have serious issues with getting my yarns tangled without even trying! Good luck guessing what this week's hat looks like! But it was fun mixing and matching colors! Version 5! Band of many colors! Remember those watches in the 90’s that had the bands of different colors, you could interchange? This hat is like that! You can make as many belt bands to match your hat as you want! Notice, the green band is smooth and flat because it has been used once. Rounds 7 -17. Repeat Round 6. Note: Check hat to see if you need to add more rounds or take a round off. At this point your hat needs to cover your head to the top of your forehead. Round 18. Do not sl st in next ch, ch 1, 1 hdc in same space as ch 1, hdc in next sp, ch 2, sk next 2 sp, hdc in next 2 sp. ( ch 2, sk next 2 sp, hdc in next 2 sp ) 13 times, ch 2, sk 2 ch, Sl st in top of hdc. Round 19. Ch 1, hdc in same sp as ch 1, 1 hdc in next sp, 2 hdc in ch 2 sp, ( 1 hdc in next 2 hdc, 2 hdc in ch 2 space) around. Round 20. Ch 1, hdc in same sp as ch 1, 1 hdc in each sp around, join with sl st in top of hdc. Fasten off, and place marker or piece of yarn where your last stitch was made.. The Belt Band can be worn on the side of the head or worn in the back, it’s your choice! Use a size H hook for your belt band. Use your leftover yarns; it only takes a few yards to make this. Sl st in 2nd ch from hook, sl st in next 17 ch, sc crochet in next 81 ch, sl st in next 18 ch. Note: If your count is off by 1, or 2, or 3 its ok. It’s not noticeable; you will not be able to tell! You can make the belt band in as many colors as you desire! Have fun! Note: You can make your band longer if you want more to hang down behind you or on the side. Remember to have the same amount of sl sts on each side! You can experiment with different types of yarn. Make a few inches to check if it will fit in the spaces for your hat. You can change your hook size to get a different look in its size. You can add beads to the sl sts, you can make the band very long to hang down your back, you can put your hair in a elastic hair band at the base of your neck and braid the belt band with your hair, remember to make it long enough. How to weave Belt Band in your hat. 1. To the right of your marker, begin weaving your belt band. Place one of the sl st ends inside the hat and pull up until the other sl st side is hanging down with all 18 sts hanging inside the hat. 2. Place first sl st end into next sp pulling it down to the inside of the hat. Make sure band is straight and not twisted. Continue pulling band up and down through the spaces keeping it straight and not twisted. 3. When you reach the back of the hat, place your sl st side in the first space you started with going in from the outside of the hat to the inside. Tie the ends together. Push knot through sp so it is showing on the outside of your hat. This hat was made with Simply Soft Black acrylic yarn, a size J hook, 20 rounds and no edging. Belt Bands are made of scraps of Simply Soft and Red Heart, using an H hook. Please if you find any errors let me know! Mom was sick this week so I didn’t proof it 4 times! WOW! What a mess of color!!! Could this be a hat? It looks like to many colors! This is today's hat! I will be home this afternoon to put it up! That really is a mess of colors! Crochet BHP Version 4, A New Stitch! Guess what this baby to toddler size hat doesn’t use? Double Crochet! I have changed it up to use hdc! Same BHP just a different stitch! Here is the hat with no flower on it. Note: Do not sl st in next ch for remaining rows. Optional; You can add flowers to your hat if you would like to personalize it! took just over 2 ounces of yarn to make this one. 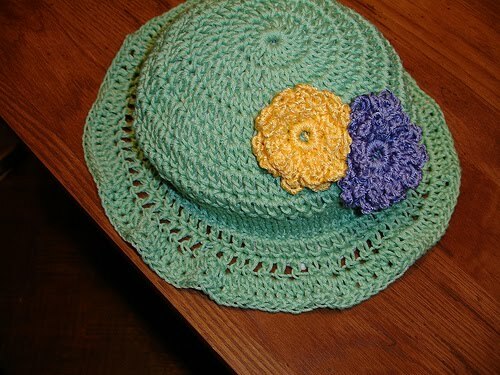 The flower pattern came from “Crochet Bouquet” By Suzann Thompson. 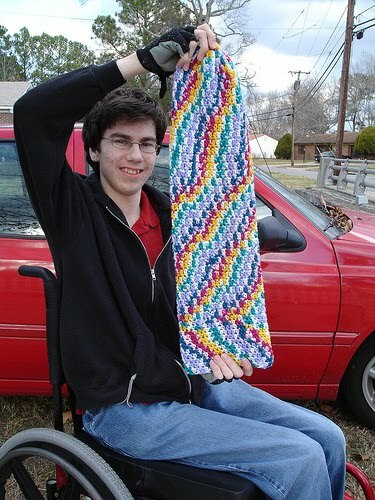 The pattern name is “Small Petals Around” pages 36 and 37! I love this book! 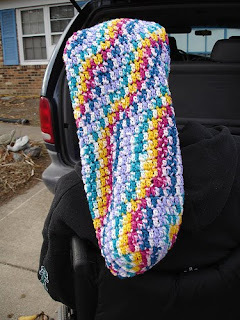 I keep one in the car with my car crochet projects and another for the house! Good Morning!!! Let's have a sneak preview!! It's a hat kind of day!!!! I thought I would give you a sneak peek of today's hat! It's really cute and cuddly! She lets me try all my baby and toddler sized hats on! I'm leaving for the nursing home. I try to leave early on the weekends but that didn't happen yesterday! Hopefully I will only be there for five hours today! I have made your basic hat in white. I'ts just a pull on, yank of kind of a hat, a beanie! The kind you throw on your bed, the floor, or in the hallway! You have to use your imagination, just take this basic white hat and fun with it! I will give you some ideas! Rounds 7 -16. Repeat Round 6. This hat was made with leftover “Mainstays” worsted acrylic yarn, 3 ounces, a size I hook, and 16 rounds with no edging on the hat. Coming In September! The Tube Sock Hat! Its that time of year! Summer's not over but school will be starting before you know it!! I'd like to share a couple of pictures of a hat I made for my son, (he's in college) that he wore a lot in the cold winter months. It was made from my BHP and I will post the pattern in September. I dubbed the hat "The Tube Hat". Jonathan named it "The Tube Sock Hat"! He says it reminded him of tube socks he wore as a child that went to his knees! Edging: 1st round: Sl st in next ch, ch 1, hdc in same sp as ch 1, hdc around, join to first hdc made. 2nd round: Sl st in next ch, ch 1, sc in same sp as ch 1, sc around, join in first sc made. This hat was made with Red Heart’s Delft Blue, 3 ounces, a size H hook, and an edging of hdc and sc. Approximately 2 ounces of A, solid color. Approximately 2 ounces of B, variegated color. *To save time weaving in loose ends, carry them behind the round you are beginning to work on crocheting over them. You will be happy you did! Using color A ch 4, sl st in first ch made. Rounds 7 -16. Repeat Round 6 changing colors each round until hat is desired length. End with color of your choice. Edging: Sl st in next ch, sl st in each sp loosely. If your sl st is too tight your hat will not have enough give or stretch to put on your head! This hat was made using Red Heart’s Dark Orchid, (solid color) and Red Heart’s Plum Pudding, (variegated) yarn. A size H hook was used with a slip stitch edging. Today I hope to put at least 2 more versions of the BHP today. It will be late this afternoon. I need to go to nursing home this morning to be with mom. I would greatly appreciate if any of you spot an error please let me know! Thanks in advance. I'm not a designer, just have this pattern I created for making hats for me and cancer patients. Over the years I have used it to make gifts for family and friends.